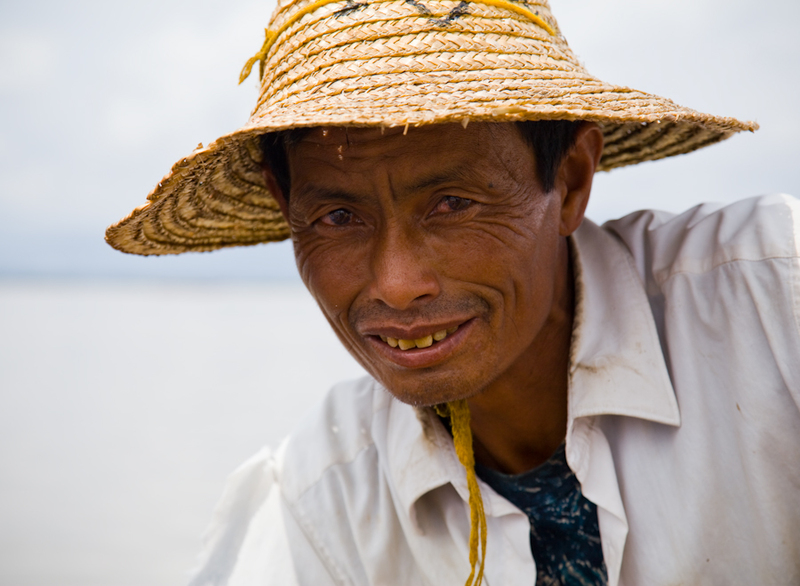 Myanmar – Every day is a highlight! Since I’ve returned from South East Asia, people are continually asking me what was my highlight, where was my favorite spot. The best answer I can come up with is ‘All of Myanmar’. It amazes me to think back about my trip that was only a couple of months ago and think about this beautiful, largely undiscovered country. Take for example the morning that a small group of us did a little photo tour to an area just outside the downtown area of Yangon. We walked for about 15 minutes and were outside of the business district, watching the city wake up and begin bustling with locals preparing a small market. We were there before sunrise and saw the monks lining up for their morning rounds and collection. I’m really not sure who was more curious, them or us. It is so incredibly interesting to go to an area where tourists are so rare that they actually become an attraction in the place they’ve gone to visit. I’ll admit, I was a bit shy, not knowing how to approach or talk to the monks, but soon enough I came to understand that they were happy to see us and happy to practice their English skills. I wandered around taking a few photographs and then one of the locals invited us in to the monastery to enjoy a local breakfast. A few minutes later the group of us were taking off our socks and shoes and following the kind man into a large dining area filled with locals. Barely with our bums in the seats, local men and women were coming out of the kitchen area with various dishes in hand and filling the table with typical breakfast consisting of rice, noodles, fish soup and then sweet sticky rice came along a little later. They filled our bowls and when we were done, they immediately appeared to fill them up again. They certainly didn’t want us to leave hungry. These were the community members who came together to cook food for the monks at this monastery, but the monks were all out on collection at the time. 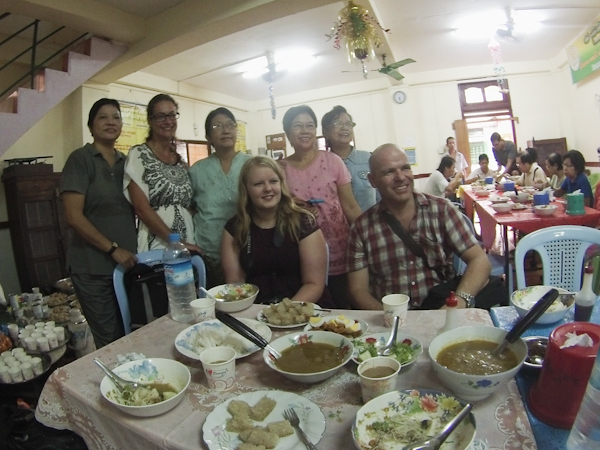 After we finished our meal, we were surprised as the locals gathered around and wanted their photos taken with us. It was only my second day in Myanmar and I was already learning that tourists were as much of an attraction as the attractions were to the tourists. With an open mind, even the simplest of pleasures can turn out to be a highlight of the trip. Similar to most, I expected extreme poverty. After all it is one of the poorest countries in Asia. To my surprise, our overnight bus from Yangon to Mandalay was beautiful, high end and even had a hostess on board. It was comfortable, with reclining seats to a much better decline than standard buses. Each of us was given a thick warm, fuzzy blanket and a hostess was available for questions and assistance throughout the night. On top of that, the recently built divided highway was mostly smooth sailing and despite the rain, I didn’t feel fearful or uncomfortable at all throughout the night. I just laid back and slept. 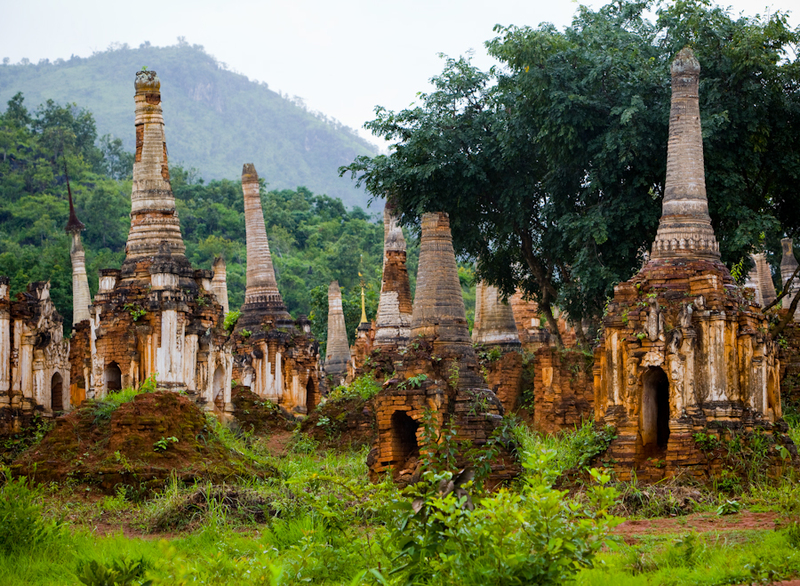 Most of the tours that are offered to Burma / Myanmar, range from 12 – 17 days. Sadly, I was on a shortened version and had to pack as much as possible into only 10 spectacular days. 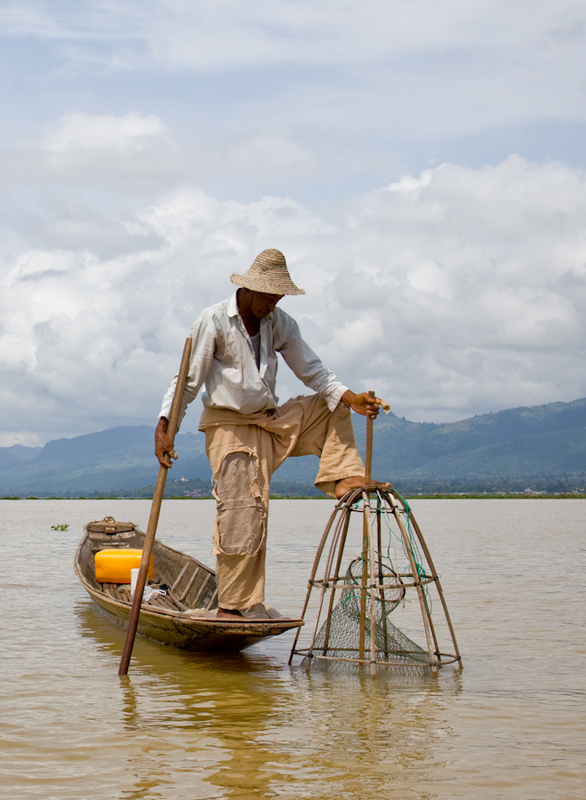 Because of the shortened itinerary, we had only one full day to explore that wonders of beautiful Mandalay. Although the core of the city itself isn’t really a highlight, there are lots of beauties to enjoy on the outskirts. A few hours to half a day can be spent enjoying the beauty, history and culture of the ancient U Bein bridge in Amarapura. Just simply watching the way of life, traveling by boat across the lake and then returning by walking across the 1.2 km ancient teak wood bridge. Along the way you can stop and taste local delicacies, take in the spectacular views and meet a few new local friends selling souvenirs. Don’t be put off though, despite the fact that they are there to make a living and sell their wares, I found the local kids particularly respectful, friendly and interesting. We only had about an hour to spend, which was far too rushed for this beautiful spot, but in that hour I managed to take a boat ride to the middle of the lake and then return on foot across the bridge. I met a young girl who walked back to the main land with me. We chatted about her family, her schooling and life on the lake. Her English was excellent, she was friendly and she didn’t ask me to buy anything until we were nearly back to the main land. It was at this time that I bargained with her a little and purchased two necklaces … one with jade elephants and the other with amber. We spent the remainder of our day in Mandalay crossing the Irrawaddy river to Mingun, a small community with some big claims to fame. The tiny community hosts the world’s largest bell (over two tonnes of iron), the unfinished, Pahtodawgyi pagoda and the beautiful Hsinbyume pagoda. We spent a couple of hours wandering around, visiting the sites and dodging rain, which came and went in fits and spurts. Although the rain slowed us down a little as we waited for it to stop under the cover of a big leafy tree, it certainly didn’t ruin the experience and I wouldn’t change it for a second and replace it with a mass of tourists. I’d much rather travel in green season dodging a bit of rain than dodging hundreds of tourists. Having said that, it’ll be quite some time before Mingun sees hundreds of tourists at one time. Possibly the largest and best known attraction in Burma is the community of Bagan where they boast over 2100 pagodas, temples and structures in 42 square kilometers. The desert landscape dotted with structures of all shapes and sizes is absolutely spectacular. Take the time to see it at sunrise and sunset; it is truly spectacular. 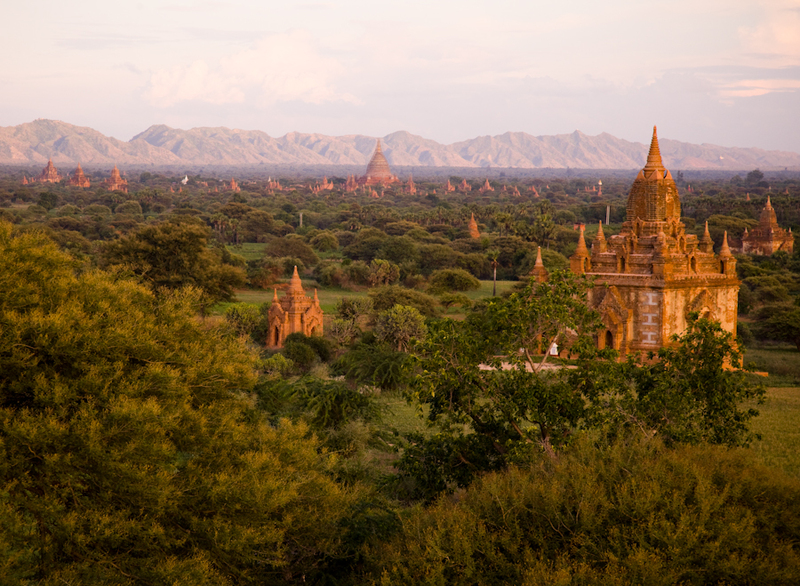 You can spend hours biking amongst the structures on dirt roads winding through ancient old Bagan. But, beware of the heat. Make sure you have sunscreen, lots of water and a hat to keep the sun off your face. Although the land is nearly flat, the heat adds it’s own challenges to your physical abilities. Stop often and discover as many of the structures as you can. Each one is unique and the art and architecture will amaze you time and time again. After enjoying the beauty of Bagan for a couple of days, we were off for a short visit to the Mt. Popa area. Mt. Popa is a volcano and an area that you can hike, but we simply passed over and twisted around the big mountain with a stop in the community to hear about the spiritual nats that are worshiped at the pagoda atop a mountain. Oh yes, and to meet the cheeky little Macque monkeys that scatter the town. If you have time, you can climb the 777 steps to the beautiful monastery at the top of the mountain, but beware as the monkeys live and play along the way, so I hear it is dirty and smelly. Our next stop was a lovely lunch and visit to an elephant conservation camp. Hearing the story of how the organization started and how they have retired five or six elephants from the lumber industry to live peacefully and well taken care of until the end of their lives was inspirational. This organization has purchased these elephants, each of their handlers (Mahoot) and the Mahoot’s family. Not only have they given the elephants a respectful home, but also have created a community and schooling for the Mahoots and their families. We had the amazing opportunity to feed the elephants banana snacks and then help bathe them in the river. They are so large, yet so quiet and gentle. I stood mere inches from their mouths, which were big enough to swallow me whole, and I grinned ear to ear with excitement the entire time. 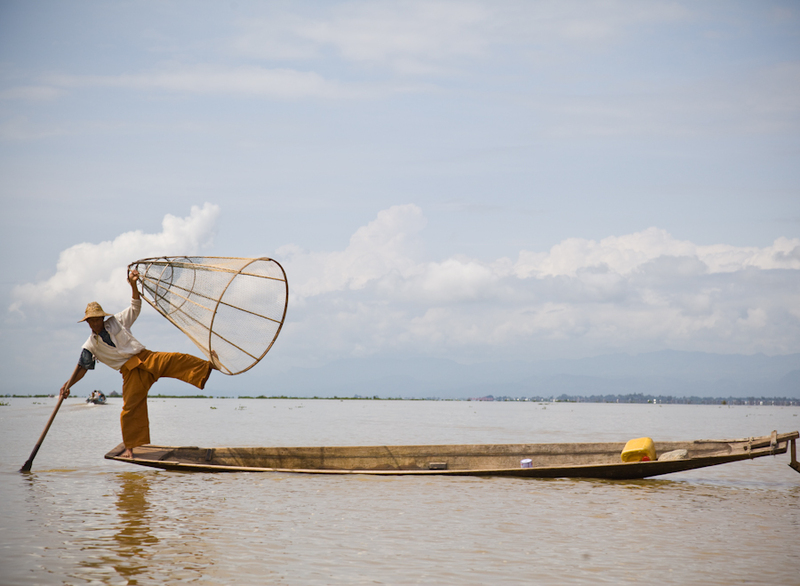 Last, but not least, we visited beautiful Inle Lake, which had different, yet incredible feel. As you can imagine, life on a lake is quite different from life on land. From the local market that we visited to the leg-rowing fisherman balancing on one leg on their flat boats, to the craft industry workshops – seeing the local way of life was eye-opening and incredible. Again, we were a bit rushed as our trip was a condensed version, but we managed to see the highlights and even take in the largely undiscovered and quiet Indein where there was not another tourist to be seen amongst the many hundreds of stupas and structures. Magical is not a word strong enough to describe the experience. At the end of the trip we asked if it was possible to visit an orphanage or monastery and arrangements were made for our last evening in Yangon. We made a donation to the orphanage and had a tour of where schooling takes place, where the children sleep and the communal areas. Then we had the amazing opportunity to dish out food as the young monks gathered for supper. Young boys as little as four years old walked up to the serving area perfectly mannered. If we gave them too much of something, they politely put a portion back. It was a great lesson in humility and understanding to only take what you need and leave the rest for someone else. Of course, the monks were allowed to come back for seconds, so no need to waste food! Take only what is needed and if they are still hungry come back for more. It’s simple, every single activity, every single day was a highlight. There was something new, exciting and simply beautiful around every corner and I just couldn’t get enough. 10 days was a great overview and a taste for the amazing destination, but easily I could spend a month exploring just the nooks and crannies of the ‘tourist’ areas, not to mention the lesser visited areas. And, as tourism begins to grow, more and more areas will be open for exploration by foreigners. In my opinion, Myanmar is a destination to be visited now, before it explodes in popularity, and then visited again and again as the economy gets stronger and new areas open up. There’s nothing quite like seeing a destination that isn’t used to tourists and getting an authentic feel for the people, the culture, the food and the beauty without the corruption of the tourist traps. Go see this destination soon to get an authentic feeling for the country. Then, explore it again later as more destinations open up. You won’t be disappointed. NOTE: My fabulous tour was with Tucan Travel. The are a small group adventure company with hundreds of tours to choose from. However, I highly recommend them for their Spiritual Burma Tour. I was on a condensed version, but the full trip would be amazing! Next up was a short, but sweet visit to U Bein Bridge in Amarapura. This bridge connects an island to the main land, spanning the Taungthaman lake at 1.2kms long and is made from salvaged teak wood posts (or columns) from an old palace that was being moved from Amarapura to Mandalay. It was constructed in the 1850’s. It is the world’s longest teak bridge. The surprisingly sturdy teak-wood bridge is beautiful to look at and is of daily importance to the locals as they walk to and from the main land for work, school and markets. It is best known to tourist for it’s beauty at sunset and is one of Mandalay’s most photographed destinations. Unfortunately, it was only a short stop for us, so I did not get to see it’s beauty in the setting evening sun, but none-the-less, it was still amazing and full of life, functional and very active with locals. It was one area where we did see a couple of dozen other tourists, which is still incredibly miniscule. Several of us opted to take a boat ride to the halfway point and then we walked back along the bridge (4000 kyat for 3 – 4 people). The heat was nearly unbearable, but the breeze on the water was refreshing. Along the way we saw people fishing from the bridge and from the water, as well as people swimming / bathing in the water. On our way back each of us was approached by a child selling items. These children have been trained to ‘make friends’ with one tourist each rather than surrounding and bombarding all of the tourists at once. They love to practice their English with you and I found that the girls who ‘friended’ me were very polite and not pushy. They certainly told you about the items they had for sale, but they weren’t demanding that you buy them. They were hoping if they had a chat with you, that you would be nice enough to buy them. I suppose this likely makes it harder for tourists to bargain as hard as well. At least for me, once I feel like I know someone a little, know about their family, their schooling etc, it is harder for me to offer them only half price. I chatted with a young girl named Ehtoo for the walk back along the teak bridge. She spoke really good English, told me about her family and that she goes to school in the mornings, but has to work in the afternoons. She showed me the jewelry that she was selling. I wasn’t interested and try really hard not to buy things if I’m not interested. But, the simple fact that she was trying to have a discussion and offering her items, but not pushing them on me … in the end I bought two necklaces from her for 12 000 kyat. She tried to get me to buy three for 15 000 but I simply wasn’t interested. Sometimes I can just walk away, especially when I’m being swarmed and hounded. But, when I’ve had one-on-one time with someone, I find it much harder to say no. I asked her if she made the jewelry herself, but she did not. She simply buys (or borrows) it from one of the larger stores on the teak bridge and then she gets a cut of what she sells. Although I would have much rather bought something that she actually made, or known that the money was going directly to her, but in the end, I guess she was making some money rather than no money and she was a really sweet kid. At the Shwedagon Pagoda, our local guide took us to see a lovely old man who did an astrology reading for us based solely on our date and year of birth. 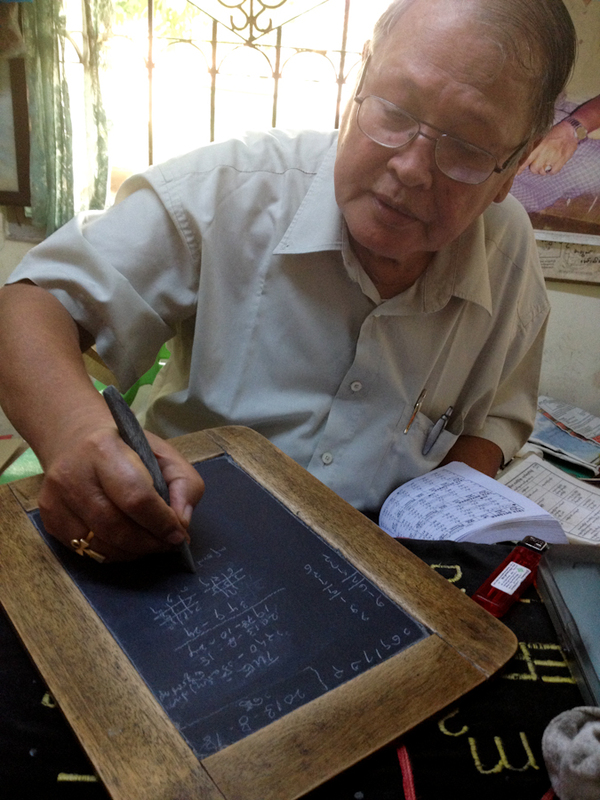 He did his math on an old-school chalk board and spoke only the local language. As each one of us went in, our local guide took notes and then translated the reading for us. Some of the group were amazed by how accurate he was. I, however, felt that it didn’t work for me. You make your own judgement. Here’s what my date and year of birth had to say about me. On August 17 our group met as a whole for the first time. Travel agents from Australia, New Zealand, England and Canada along with our tour leader from Norway and our local Myanmar guide. 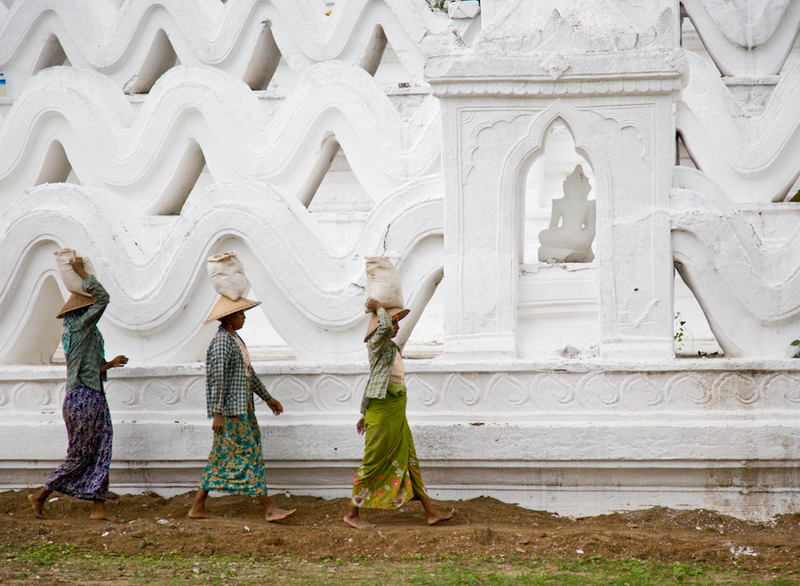 We set out for a walking tour of the city of Yangon. For the next four hours we wandered around the outside of many historic buildings in the city. We got to visit the beautiful old rail station, a couple of churches, markets and beautiful, old abandoned buildings that were scheduled to be renovated into five star hotels. 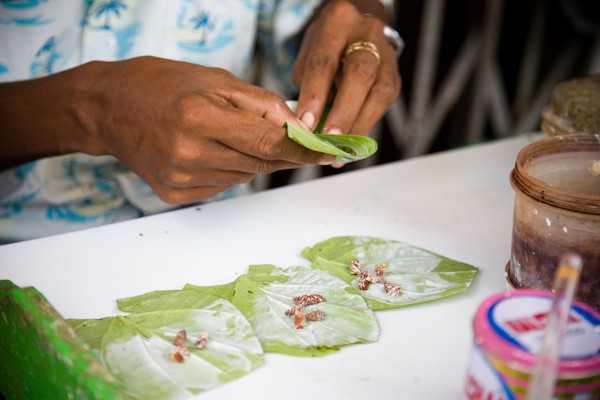 We also got our first glimpse at the process of making the ‘Myanmar-style’ of chewing tobacco (bitter leaves) at a street vendor. They are also known to turn your teeth red. Mainly men chew the leaves of different strengths and then spit the red saliva on the ground or in garbage cans at restaurants. Spitting everywhere is definitely something that I will never get used to in any city. Regularly I found myself avoiding red spots on the ground where men had spit, but after awhile, the spots became impossible to dodge. We also stopped at a local tea-shop for snacks and drinks. I was incredibly surprised at the prevailance of Coke throughout the country, but many in our group drank the local Myanmar beer and a few gave the tea a go. 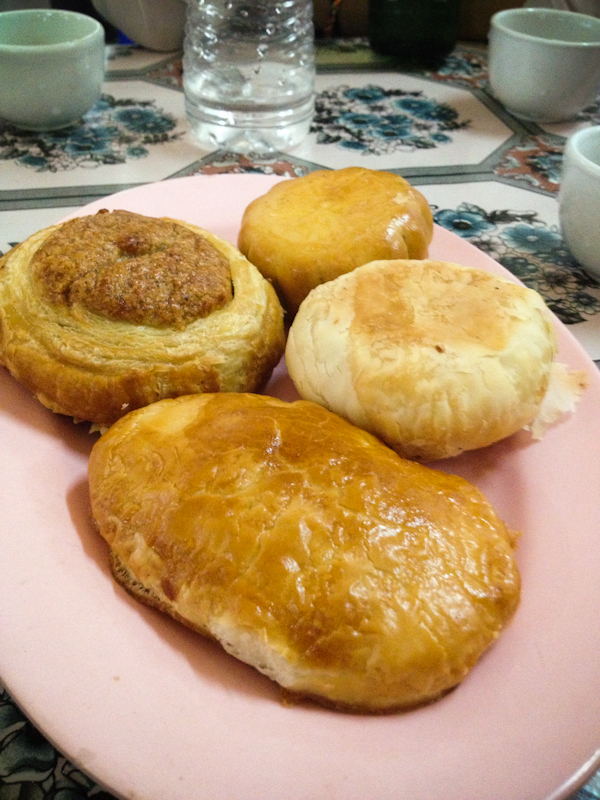 We also got to try local sweet and savory pastries of various kinds. I was the brave one to try small bites of many of them first. I’m actually not normally that brave with new foods, but pastries … well, how could you not like a pastry? I’ll tell you how … if it is made from Durian fruit. Having never travelled to Asia before, this was a new smell and flavor for me, but most of the others were familiar with it. It is known for it’s particularly pungent odor that quite reminds me of a public bathroom. Then I took a little nibble. Unfortunately, it tasted just like it smelled. A little like the smell of a public bathroom. And, that was the end of that! No more Durian fruit for me. We sat for another 10 minutes or so nibbling on the other pastries and treats, but there was no mistaking that I had cut into the durian pastry. For the next 10 minutes, the undeniable smell wafted over everyone, until we were ready to move along. 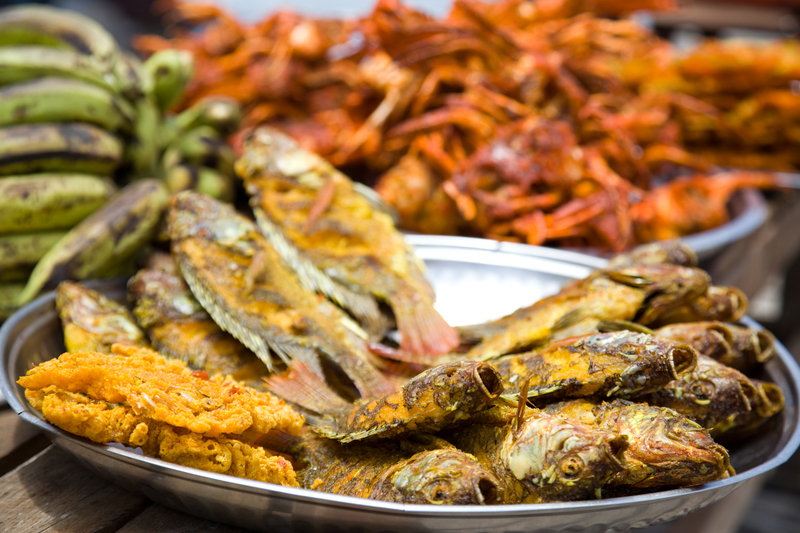 We wandered through several street markets filled with food, fresh produce and local treats. As we headed back toward our hotel, and approached the historic Catholic Church, the rain started and we understood the meaning of monsoon season! After a couple of hours of walking in the streets in the rain, we were off to the Strand Hotel for our welcome drinks. Overall, a great afternoon of learning about Yangon’s beautiful buildings, architectural history, and trying new foods. Ever since I booked the trip to Asia back in April, I’ve known that I would be traveling in monsoon season. I tried not to research too many things before I came so I could experience things through my own eyes, but I did do a little research on the weather so I would know how to pack. Throughout the southern part of Myanmar, Vietnam and Cambodia, there would be heavy rains most days for short periods of time and drizzle throughout the day. In the more northern parts of the countries, it would be just showers, not really heavy rainfall. Just to be safe I packed two plastic ponchos, my good quality rain jacket that I never travel without and a small umbrella. To be honest, I’m glad I packed them all! In Yangon, while out on our city walking tour we got caught in an afternoon downpour. Now, when I say downpour, it is actually quite unlike anything that we usually get in Canada. Although I suppose the freak rains / floods in Calgary and Toronto this summer likely compare. The rain comes on so fast and furious that you are nearly drenched before you can even open your umbrella. The rain comes down sideways and with a little wind, the umbrella isn’t really helping you stay very dry at all. If you are lucky you can find a building to duck into, but who knows if the rains will last for minutes or hours. In our case, on this particular day we took short cover in the Catholic Church while we were admiring the beauty. When it was time to go, we all gritted our teeth, put up our umbrellas and went along for the adventure! None of us were dressed particularly appropriate for what we were about to encounter. Long skirts, see-through shirts, sneakers … you name it and someone was wearing something inappropriate for the rain. Some of us had umbrellas, others were without. We were soaked by the time we got to the street corner, regardless of umbrella size. Just around the street corner the rain had started to gather and it was impossible for it to drain away as quickly as it was falling. Soon enough, cars driving by were spraying us with water. There was no hiding and most drivers aren’t considerate enough to slow down. What seemed like an hour later (but likely only five minutes), we were crossing the already dangerous and busy streets on Yangon through rivers of rain flowing so heavy that they actually had current. Did I mention those rivers were knee-high in some areas? Most people (local and foreigners) were wearing flip flops (or thongs as the Aussies call them). So, on top of being in water up to our knees, the uneven ground was slippery and flip flops easily got lost in the water. One of the travelers had been wearing sneakers and decided to go bare-foot, like many of the locals. Our local tour leader’s flip flop broke and we had to stop at a store for her to buy a new pair. Luckily, I was wearing my favorite Merrill sports sandals, the type with straps so they don’t fall off. The day prior I had been wandering around Yangon on my own in my flip flops and in my short one hour stroll I managed to get two huge horrible blisters under the toe beside my big toe. Not only did they blister, but the skin tore off and they were left open and raw. So, here I was on my second day in Yangon walking around in the dirty streets, with water to my knees. My feet were sore and all I could think about was that they were likely getting infected. Afterall, I would worry about that in Canada. Now, here in Asia, with the extra garbage and feces in the street, I was sure my feet would be black with infection the next day. Sounds gross, I know! At the end of our walking tour, we finished at the beautiful Strand Hotel for a welcome drink. All of us sopping wet and embarrassed to even be entering such a beautiful hotel. None-the-less, we were welcomed with open arms, appetizers and a gin and tonic. Despite being cold, wet and dirty, honestly, had we come in monsoon season and not experienced the torrential downpours, I think I might have been a little disappointed. I want to be able to tell people what to expect and that is all part of the experience. Throughout the remainder of the tour we ran into a lot of showers, but rarely a downpour and after the first couple of days in Yangon, we were all prepared with rain gear and umbrellas no matter what the weather at the beginning of the day. Although my raw, open blisters were incredibly sore for the next week, I washed them well that night, put some antibiotic cream and band aids on them and limped on my way. After reading all of this, I’m sure many of you think this would be an absolutely dreadful vacation. In fact, it was not and it wouldn’t stop me from doing it again in the ‘off season’. I’ve traveled to Peru and Ecuador in rainy season, Dominican Republic and Bermuda during hurricane season and now, South East Asia during monsoon season. In my mind, the benefits of the beautiful lush greenery, the fewer tourists, lower prices, fresh fruit, produce and afternoon refreshing rains, outweigh the negatives of being drenched one or two days, with showers the other days. Monsoon or rainy season really means fast heavy rains, but they rarely last for a long time. There is often cloud cover or sunshine for the majority of the day, with only a few hours of rain. Oh yes, and a word of the wise … don’t try to dry your wet clothes in an air-conditioned room. You’ll only end up with wet, cold clothes. Close your bathroom door and hang them to dry with the fan on. Like magic, they are bone dry the next morning. Next time you consider traveling, think about ‘monsoon’ or ‘rainy’ season as being more relaxed, less busy and beautiful lush vegetation. It’s all about the journey and your outlook on the situation dictates the outcome.